The Slip Stream 120mm Slim case fans are only 12mm thick and as a result they are perfect for living room PCs and PC cases with limited space. 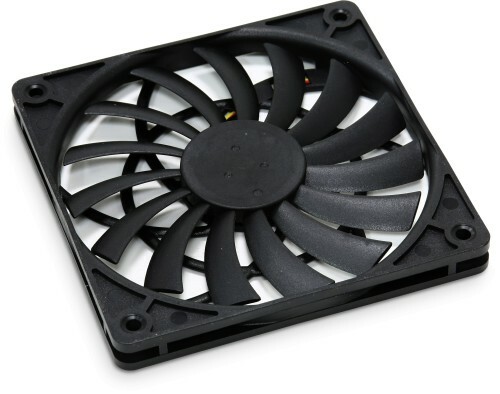 The Slip Stream 120mm Slim case fans are only 12mm thick and as a result they are perfect for living room PCs and PC cases with limited space, where a normal case fan of 25mm thickness cannot be mounted. It is also possible to use this fan as a substitute for a normal 120mm fan which is cooling a CPU or VGA heatsink. Bought this to go on the side panel for my new Gelid PC case (behind the CPU). It is very effective and almost silent! I forget it's there a lot of the time. But it makes such a difference, my motherboard and CPU temperatures have both dropped significantly, respectively by 10 degrees and 6 degrees. Will definitely be getting more Scythes in the future! Thanks Scythe and Quietpc.com!